If you’re looking for rugged, high-capacity gutters and superior installation services, turn to ABC Seamless of Albuquerque. That’s because the gutters we offer to homeowners in Albuquerque, New Mexico, and surrounding areas are designed to be durable, low maintenance, and aesthetically pleasing as well. The average gutter system has over 150 seams where individual sections of the gutters overlap after installation. These seams can be susceptible to water leaks which can cause severe damage to your home. This damage can include landscape erosion, cracking of your siding or foundation, mold and mildew, and more. Seamless steel gutters from ABC Seamless of Albuquerque, however, are specifically designed to be impervious to leaks. That’s because we measure and custom-cut our gutters on-site to ensure they perfectly fit the dimensions of your home without any seams where leaks often occur. 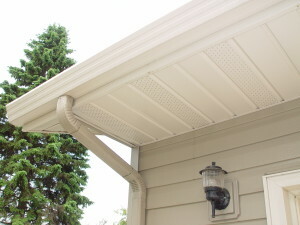 Additionally, most traditional gutters need to be painted once or twice a year. All of our gutters are virtually maintenance free, meaning they will never need to be painted. Greater capacity – Our gutters are up to 30 percent wider than most standard models, allowing more rainfall to be carried away from your home at a faster rate. These wide gutters are perfect for homes in and around Albuquerque, NM, because of the dynamic weather patterns in this area. Durability – Before installation, our gutters are constructed from heavy-gauge, hot-dipped, G-90 galvanized steel, which is stronger and thicker than vinyl and other popular gutter options. Variety of colors and styles – Our gutters are available in nearly 30 colors, and are fashioned to blend effortlessly into your existing soffit and fascia, so they’ll disappear into the roofline for a sleek, sophisticated look. If you are ready for new gutters, installation can be scheduled at a free consultation, so contact us today to set up an appointment. ABC Seamless of Albuquerque has proudly served residential and commercial customers in the Albuquerque, NM, area since 1989 and has earned an A+ rating from the Better Business Bureau.